I had the second part of this written and it was a lengthy article of wonder. All ready to go for a cut and paste into the blog. What happened? Well I had it saved as a draft in gmail (which is where I write my posts so I can work in it on any one of my computers), but as I selected it all to copy, I hit control+v instead of control+c. And then gmail autosaved right then. And control+z? DID NOTHING!!! I had a mini breakdown. It started with numbness then pain, then anger and depression. 😛 Anyway, (sigh, the acceptance phase), here we go again. This was a panel consisting of Gayle [Everyday I Write the Book], Yen [The Book Publicity Blog], Ann [Books on the Nightstand], and Thea [The Book Smugglers]. Heather [Age 30+ Books] moderated. The point of this panel seemed to be that to have a successful blog need to market it. You need to brand yourself, and have a particular niche. It sounds difficult, but really branding should be easy for bloggers – just be yourself and let the passion come through. Have a hook or an identity. The idea can rub people the wrong way, but it’s useful to have something, even if it’s a tagline, to say who you are. Anything can become your brand. The panelists also said it’s important to spend time community building. For example, when The Book Smugglers first started, they responded to every comment. All the panelists agreed about commenting. You can create dialogue by commenting on other people’s blogs as well. Another idea is to do guest reviews or have guest reviewers come to your blog. Having an event can also build community. Another Book Smugglers example is their event called Smugglevus which is based on Festivus and is basically a book love fest. You could also create some kind of online book club. Know who your readers are and go about finding them and connecting to them. There was some discussion of using social media like twitter and facebook to get readers, but not to spread yourself too thin. You don’t need to sign up for everything, just look at whats out there and choose a couple of things. If you are trying too hard it shows. As an aside it was noted that if you have a blog, make sure your RSS is easy to find. Have a big ol’ link or icon so readers know how to add a subscription to your blog. The discussion went to stats for a little bit. Publicists like to get stats so that they can decide whether a blog is popular and would reach a lot of readers. Many of the panelists felt like stats are an imperfect measurement (I don’t recall the exact wording here). A blog may have small numbers but hold a lot of sway over it’s readers in what it recommends. On the other hand, Thea from the Book Smugglers disagreed and said that they pay a lot of attention to their stats and are open with having a counter and with telling publicists their stats. [ How do I feel about this? I think it’s one of those hot button topics where people have strong opinions. Remember last year, the discussion after Katiebabs posted commentary on the Book Blogger Panel at BEA, 2009? Anyway, I personally have mixed feelings. I do want stats to go up so that I know people are reading my blog and I can have discussions with MORE people about books (yay! ), but I also admit I don’t look at them all the time, and with three mirrored blogs, with different difficulty in getting stats from them (wordpress is good, vox is awful, LJ has stats for paid members and I wasn’t always paid), I usually find it confusing to figure out]. The final comment was that one of the panelists put up a survey to find out who their readers were and they were surprised by the results. They found out that they had a lot of readers who weren’t book bloggers or book publishing people. The recommendation was to know your readers. Survey them to find out who they are for example. Another panel with Zetta [Fledgling], Terry [The Reading Tub], Wendy [Caribousmom], and Stephen Bottum [Band of Thebes]. The moderator was Marie from The Boston Bibliophile. 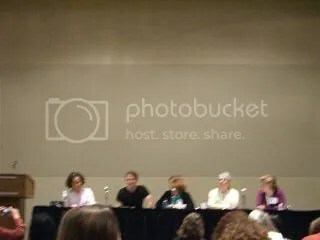 In this panel, the two blogs Fledgling and Band of Thebes seemed to have a strong focus on their causes (race and LGBT in books respectively), while The Reading Tub and Caribousmom were book blogs which also tried to bring attention to causes important to them (Children’s literacy and pediatric cancer) but it wasn’t the main focus of their blogs. I didn’t take notes for this panel so what I have here comes from memory. The main point of this session seemed to be that bloggers can affect change. The panelists brought up the recent outrage in the blogging community over the whitewashing in covers, and how bloggers got Bloomsbury to change its covers twice. There was a comment from the audience that sometimes bloggers don’t notice, such as the case when the cover for The Mariposa Club – where Latino characters were depicted as paler than the story described, and a fourth transgendered character isn’t shown at all. Zetta said she was disappointed in herself and in her community for not knowing about this, and said that bloggers need to use their connections and email other blogs to pass along this type of message. She also said it’s important to make alliances with other communities so that if there is overlap (like in this case where the LGBT and minorities are affected), they can work together in expressing their disapproval. Another point I remember was that someone asked if anyone encountered any negative commenting on their posts because of their causes. Stephen Bottum said he didn’t have any angry commenters, and Zetta agreed that in her personal blog other commenters were good about redirecting the conversation back to the topic on hand, but when she posted on The Huffington Post she had more nasty comments and doesn’t post there anymore. I liked this panel. I think that many people have a cause that they feel strongly about and that blogging is a good away to put it out there, even in a small way. Actually, at the BBC there was a blogger who mentioned wanting to do something for the schools in Nashville, who lost a lot of books due to the flooding, and here’s a link on how to help. (I made buttons, will post later)! I didn’t take notes on this panel either. So this is from my memory again and is basically a vaguely remembered summary. I think the first part of this was about how as people use social media and spend time online, they begin to develop relationships and sometimes this can put you in an awkward place when talking about a book written by someone you have a relationship with. The two authors said that they don’t review books. They may pimp their friend’s books, and say why they liked the book, but won’t say anything negative. Beth Kephart said that if she didn’t like a book she won’t say that, but she doesn’t lie either – she would just discuss why she likes her friend and describe the book they have coming out. The authors on the panel also said that authors should not engage with a reader who has written a negative review. Kephart says she tries not to read reviews, but occasionally reads reviews friends have sent her that were positive and she appreciates the time reviewers take to write reviews. There was an audience member who said they wrote reviews but wanted to become an author, and asked for tips regarding doing that. It seemed like there was no real answer for how to be an author and a reviewer at the same time, but the authors thought it was possible. The book bloggers said that if they had a relationship with an author they would disclose this in a review (I think this was the Story Siren), but also said if they tweeted to the author once that they were reading their book, this didn’t count as a relationship (also – don’t tweet your review to an author if it’s a negative one!). Amy from My Friend Amy said that if she likes an author and has a relationship with them online, but then does not like a book, she may end up not reviewing it. It seems to be up to the blogger how they want to handle that situation. Some people still review the book, others find it too awkward and don’t. So there you have it. As you can see there were a lot of panels, but I was happy to be sitting down after walking around with 20 pounds of books for two days. For improvements, I think that I’d like to have had a longer break around 3 when I started to flag, rather than having the small 10 minute breaks between sessions. Also I’ll bring a jacket next time – it was freezing in the conference room. Another thought is I’d like to see more genre fiction bloggers (romance for instance). 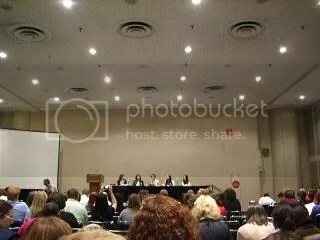 Although it looked like the organizers tried to have diversity in book bloggers, there were more general fiction and children’s/young adult book bloggers than anything else (but then, there are more of those kinds of books at BEA). Overall I was impressed with the organization and look forward to see it grow next year (which I think it will). This entry was posted in events and tagged bea, book blogger convention, nyc by janicu. Bookmark the permalink. Yep, sometimes I feel very glad that I live so close to NYC. HEY! Thanks for the mention and the link. And the button is looking GREAT! Oh awesome! I want to make a post with the buttons but I’m visiting friends for the weekend so I’ll be snatching time when I can to work on that. Taking me longer than I wanted. Wow! You’ve got a great memory. There are so many ways we can effect change and encourage others to do that same. Thanks for the great recap! Thanks you. I hope I remembered correctly. I think my memory is only good for 2 weeks (and that’s when I’m interested and paying attention), then it’s gonnnee. Which is why I have to write things down.